When you get right down to it, many musicians are one-trick ponies — they get to a point where they can do one thing really well (stylistically) and ride that sucker till it's past its due date (or they die). 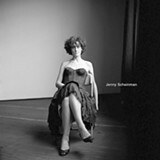 Conversely, Bay Area-bred violinist Jenny Scheinman has performed in assorted styles with a dazzlingly diverse cast of characters: Norah Jones, Bill Frisell, Jimmie Dale Gilmore, Bruce Cockburn, and local avant sax quartet ROVA. Aside from assorted sideperson gigs, Scheinman has two parallel careers as a leader, one in the overlapping spheres of jazz and improvised music, the other as an Americana singer-songwriter. Her self-titled platter is a spare, bracing, gratifying thing, brimming with originals and choice covers reflecting the panorama of American roots sounds — pre-Nash Vegas country, folk, electric blues, Appalachian, rock, even classic radio pop. Scheinman sings with a sturdy, plainspoken, heartfelt alto — imagine Alison Krauss' older, somewhat world-weary sister or Lucinda Williams' younger, less boisterous sibling. "Twilight Time" and "Shame, Shame, Shame" possess a stark, unrefined (though not sloppy), almost eerie ambience, as if recorded in a back-country gin joint or VFW hall on a Sunday afternoon. The loping lament "Skinny Man" is a cross betwixt Tony Joe White and Cat Power, yearning Southern soul with keening violin and searing slide guitar.